New migraine drug significantly reduces patients’ monthly migraine days and seems to be safe. The drug is called Erenumab or AMG 334 and was co-developed by Novartis and Amgen. 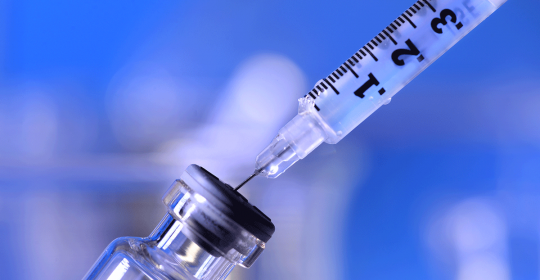 They released a press statement about the phase II study showing the benefits of Erenumab. Erenumab or AMG 334 is a human monoclonal antibody targeting the receptor of Calcitonin-Gene-Related-Peptide (CGRP), thus inhibiting Calcitonin-Gene-Related-Peptide (CGRP). CGRP is known to play an integral role in the pathophysiology of headaches. CGRP is responsible for the dilation of blood vessels in the brain, inflammation of nerves, and transmission of pain signals from blood vessels in the brain to the nervous system. Therefore CGRP is a target for many new preventive migraine drugs. The drug needs to be injected under the skin (subcutaneously) only once a month. • Erenumab significantly reduces patients’ monthly headache days. Patients receiving Erenumab had 6.6-migraine-days less per month, versus the placebo group with 4.2 days. • Erenumab seems to be safe. Side effects were similar to the placebo group. However, it was a phase II study and it might take some time before the drug is available on the market. Learn more about clinical trial phases here.